Your days of just "eyeballing it" might soon be over. Not that anyone's crying over your stupidly strong margaritas. 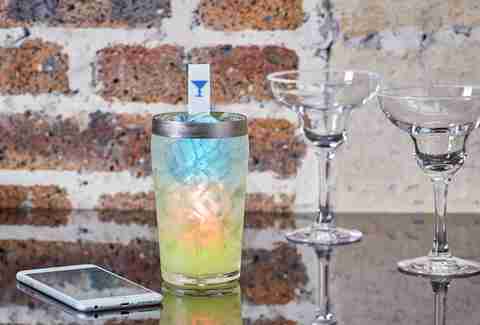 Enter the MixStik, a high tech swizzle stick that uses LED lights and motion sensors to guide you through cocktail recipes, so you can get them just right for once. As reported by Mashable, the 10-inch device was on display at a consumer electronics sideshow in Berlin and is expected to soon land on Kickstarter for $39, which is probably more than what you paid for your cocktail shaker. 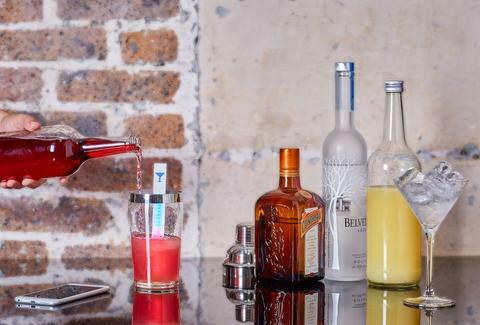 The MixStik works by pairing with your phone via Bluetooth and a mobile drink recipe app, where you can select the cocktail you'd like to make, according to the report. Once you've picked your poison, the MixStik will show you exactly how much of each ingredient to pour into your glass by using LED lights with each ingredient appearing as a different color. The thing will even help you measure the width, height, and top of your glass so that the app knows how much liquid it can hold and adjust recipes accordingly. It might as well just make the damn drink for you. However, you'll have to be careful not to use the MixStik upside down, as the area housing the device's USB port isn't waterproof, or uh, booze-proof. The makers hope to start shipping the futuristic bar tools next spring, according to the report. You can just keep practicing your eyeballing skills until then. Tony Merevick is Cities News Editor at Thrillist and is perfectly fine just eyeballing it. Send news tips to news@thrillist.com and follow him on Twitter @tonymerevick.